Another fun, colorful painting to add to my Dance Series. I thought the whole story of Taxi Dancers was so interesting. I have seen this in movies but never knew it actually had a name. Dance hall in its general meaning is a hall for dancing. 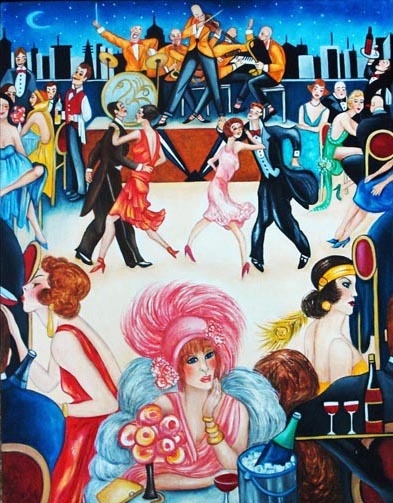 From the earliest years of the twentieth century until the early 1960s, the dance hall was the popular forerunner of the discotheque or nightclub. The majority of towns and cities in the West had at least one dance hall, and almost always featured live musicians playing a range of music from strict tempo ballroom dance music to big band, swing and jazz. One of the most famous dance hall musicians wasGlenn Miller. A taxi dance hall is a type of dance hall where dancers (who are usually young women) called taxi dancers are paid to dancewith patrons (usually male). The owners of a taxi dance hall provide music and a dance floor for their patrons and taxi dancers. In the United States during the 1920s and 1930s, when taxi dancing was at its peak, patrons of taxi dance halls would typically buy dance tickets for ten cents each. When they presented a ticket to a taxi dancer, she would dance with them for the length of a single song. Taxi dancers earned a commission on every dance ticket that they collected from their male dance partners. The ticket-a-dance system is the centerpiece of the taxi dance halls.